The small-scale Microwave Mapping Transparency Sensor System is shown. The system was developed by Compass Technologies Group under an Air Force Small Business Innovative Research agreement and loaned to the company through a Cooperative Research and Development Agreement with the Air Force Research Laboratory Materials and Manufacturing Directorate. The Air Force Research Laboratory and a small business are partnering to advance critical aircraft coatings. Under a cooperative research and development agreement, also known as a CRADA, the AFRL Materials and Manufacturing Directorate (AFRL/RX) loaned a small-scale Microwave Mapping Transparency Sensor System to Georgia-based Compass Technology Group. 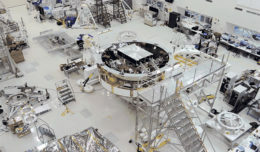 The system was created to test that aircraft canopy coatings are preventing microwave energy from getting into the cockpit and the company will use it to conduct further nondestructive evaluation testing on aircraft and radome coatings. Compass Technology Group developed the system, also known as MM-TSS, under a previous Air Force Small Business Innovation Research contract. A full-scale system has already been delivered and is being used in the production of Air Force aircraft canopies. The small-scale system was used as a proof-of concept during the SBIR project and was loaned to the company at the conclusion of the project under the CRADA. “This agreement gives us access to equipment that as a small business we wouldn’t have,” said Becky Schultz, chief executive officer of Compass Technology Group. The small-scale system uses two robotic arms, each with one of Compass Technology’s advanced microwave mapping probes, to scan components for coating measurements. The system also includes advanced radio frequency processing and human-machine interface software and tools. The combination of the automation and the wide-band microwave probe technology greatly improves measurement accuracy, saving time and money during manufacturing processes. The company is using the system on existing Air Force contracts to further research on both aircraft and radome coatings. 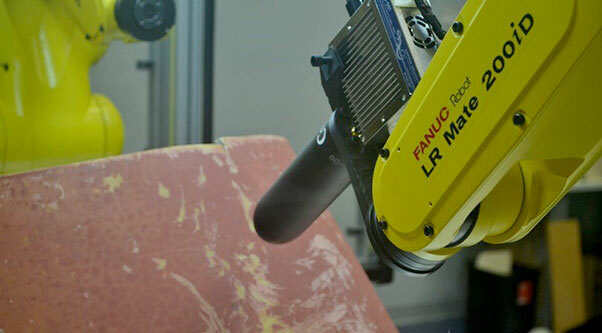 The radome testing will ensure that applied coatings are the right thickness while not hindering the microwave performance of the radome. “CRADAs are versatile mechanisms for collaboration, as well as research and development. In cases like this, they benefit the government with cutting-edge research while enabling small business growth. They can have a serious impact,” said Joshua Forbes a program manager for AFRL/RX. In addition to continued research for the Air Force, the company has its sights set on both the commercial aircraft and marine vehicle market. To learn more about CRADAs and other methods of partnering with the Air Force, call the Air Force Technology Transfer Program office at 937-904-9830.